After running an errand or two yesterday morn, I settled down in the afternoon to finish the back for this small quilt. I set a few minutes, then thought with the things I have to do today, that I best be busy getting it pin-basted because it sure would not happen today. I wish I had timed the entire process. I first stretched the back on the floor, used t-pin to keep it stretched. I spread the batting, using t-pins again to keep it spread out...then the top. After crawling around doing all that it was time for a break. I did time myself on doing just the pinning, and for that small quilt it took an hour. It is approximately 64/65 inches long--I know this cause it is just a bit longer than I am tall. And I think it is around 48/50 wide. I know that because I knew I needed more than a single width of fabric for the backing. It was up to 95ºF here yesterday...according to one thermometer. The other said 99º! The local TV station predicts it will be 97º today, while Weather Undergound predicts 102º. With temps like that, I will be hanging clothes on the line, only to return and get them by the time I hang the last item...or almost anyway. Lovely colours, Rose. I like your use of browns and beige here. I really like the colors in this quilt. We've had cool and rainy weather since we got back from Alaska. It's beautiful Rose, I just love the colors! We didn't get that hot just the low 90's but with no AC it felt like 100. Great scrappy quilt, I think I have some of those fabrics. You need to get a quilt frame for basting. I posted about mine back in January. I'm getting too old to crawl around on the floor to pin a quilt. That's a great looking quilt. I can't even imagine how much work that entails. 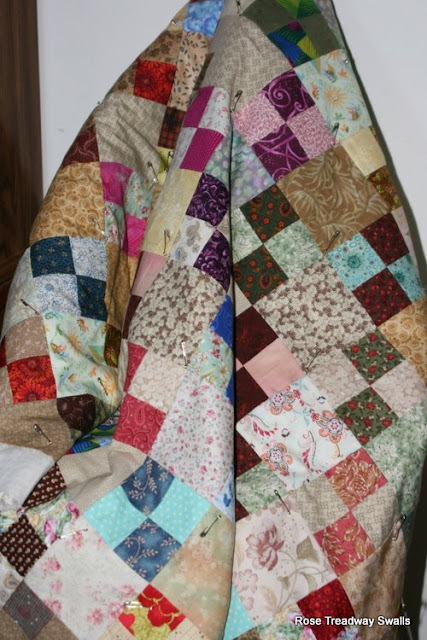 I love scrappy quilts like this. Can't wait to see how you quilt it. I had pin basting and getting a quilt ready, but I don't quilt many of mine myself. Certainly not a big one like this! It's just as hot here, too! This is beautiful, looks just a bit like the pretty one in your header. Cute kitty --probably trying to get cool. We've had hot weather down here as well, fortunately not as hot as your weather. The quilt is beautiful.